The Finals of the 2016 PBA Commissioner’s Cup kicked off last night with the Rain or Shine Elasto-Painters surviving a 41-point outburst from Alaska’s Rob Dozier to prevail. The Painters can take a 2-0 series lead if they win Game 2 tomorrow. 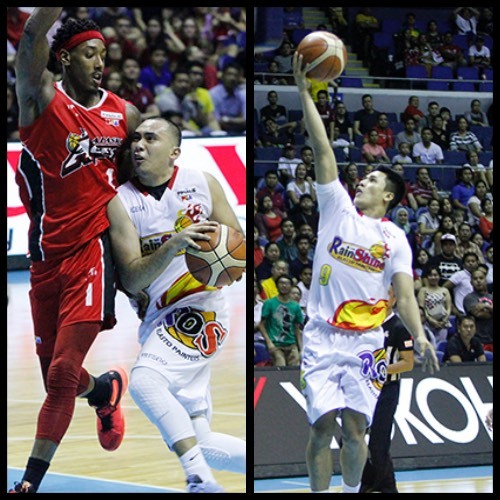 The Rain or Shine Elasto Painters weathered a huge performance from Alaska import Rob Dozier as they claimed a crucial victory, 105-97, in the opening game of the 2016 Oppo PBA Commissioner’s Cup finals on Friday at the SMART-Araneta Coliseum. Dozier scored 41 points and grabbed 15 rebounds in a terrific performance but it wasn’t enough against the balanced Rain or Shine offensive in Game 1. Paul Lee scored 20 points, including a clutch three-pointer inside the final minute, while Jericho Cruz put together a well-rounded line of 18 points, nine rebounds, and five assists. Beau Belga added 15 points and Gabe Norwood added 11 markers in the game. Import Pierre Henderson-Niles only scored six points but grabbed 13 rebounds and had three steals to help his team. Dozier’s 41 points marked his new personal-best in the PBA while Lee’s 20 was the most he has scored in this current conference. Rain or Shine will attempt to extend their series lead when the teams clash in Game 2 on Sunday. Lee came up with the biggest shot of the game as he knocked down a big three with 51 seconds remaining while Maverick Ahanmisi made four clutch free throws down the stretch to preserve the win. Cyrus Baguio finished with 14 points, while Noy Baclao had 10 for the Aces. Calvin Abueva barely missed out on a double-double with nine points and 10 rebounds, but he shot just 4-for-13 (30-percent) from the field. All 13 of the Elasto Painters who saw action scored at least two points, including surprise starter Don Trollano, who played 11 minutes. Jericho Cruz (ROS) - 18pts, 9rebs, 5asts, 2stls, 3 triples. Rob Dozier (ALA) - 41pts, 15rebs, 3asts, 2blks, 4 triples, 18/22 FGs.